Trust an experienced logistics team like AFP Expo logistics for your trade show shipping needs. 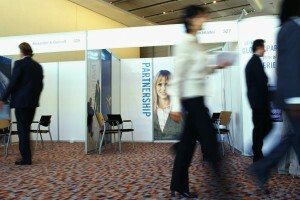 There are a lot of things to worry about when you’re planning for your next trade show. From figuring out what exactly you have to bring to determining an effective strategy for an engaging presentation, you’ll have your hands full and you don’t want any stone left unturned in your path to a successful trade show. The shipping logistics required for a trade show can be extremely confusing even for seasoned veterans! That’s where an experienced logistics company like AFP Expo Logistics can help. We have the experience and ability necessary to ensure your trade show materials make it to the venue safely and on time. When you take a look at the exhibitor’s manual for your event, you’ll notice that there are a few options in regards to getting your freight to the show. Usually, there is a minimum weight per shipment of two hundred pounds, and you’ll have to decide whether to have your freight shipped directly to the show venue or to their advanced warehouse. But who should you turn to in order to get your freight to the destination? You might think about going directly to the carriers, but UPS and FedEx have strict requirements for the weight and size of your freight. Any shipments that don’t conform to size and weight requirements will end up costing you additional fees. Going with an experienced and highly skilled logistics company like AFP Expo Logistics, on the other hand, gives your company a complete, versatile logistics solution for your trade show shipping needs. We can ship your trade show items directly to the show venue to give your team more time to prepare the shipment. Or, if you prefer, we can consolidate your shipments and send them to the advanced warehouse, where they will be stored until the show date. And, unlike going directly to the carriers, we have the flexibility to work with freight of any size or shape and you can trust that it will get to the final destination on time and safely! This entry was posted on Wednesday, March 1st, 2017	at 2:49 pm	and is filed under AFP Expo	. You can follow any responses to this entry through the RSS 2.0	feed. Both comments and pings are currently closed.